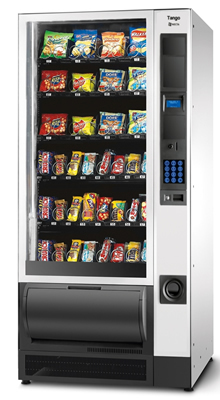 UK Vending provides wonderfully simple to operate Snack vending machines that provide a quick and easy way to sell the best selling snacks, crisps and sweets. Moreover, these Snack vending machines can be tailored for your own set of requirements. We can arrange for them to be coin or token operated and each comes with the very latest digital technology and easy to use instructions. Each machine fits seamlessly into virtually any office or work environment and are extremely durable. Even when the product has been delivered it is easy to collect from the drop down tray as with the patented ergonomic delivery area that opens outwards making it simple to collect and enjoy delicious and fresh snacks, crisps and sweets from an UKVending snack machine. UKVending has two different machines within the Tango range that can be configured for your workplace; The UKVending Snack Vending 36 and 40. The 36 is the slightly smaller of the pair and is ideal for snacks and has a capacity of 36 different selections, whilst the 40 is slightly larger and can also vend drinks cans. 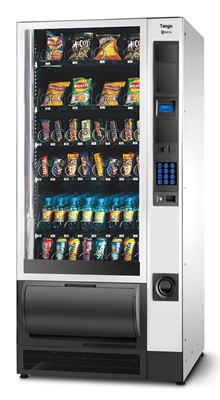 The range of products available to refill both machines is impressive with a total of 466 products available to order from UKVending.